Kato USA Inc Unitrack Power Pack Discounts Apply ! KAT22014 - Kato USA Inc Unitrack Power Pack. 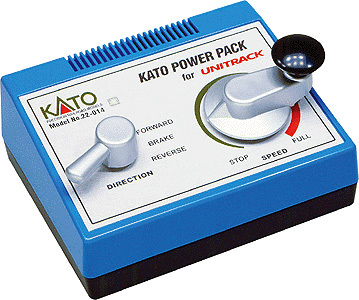 The Power Pack is the best choice for use with Kato Unitrack and locomotives. Features direction and speed controls, circuit breaker with reset button and turnout control switch with snap-on socket. Direct plug-in for Unitrack feeder track or terminal joiner and adapter cord for connection of feeder track by other manufacturers. Pack includes separate power adaptor. Works with HO and N Scale. 12V, 1 Amp. DC trains only.